Founded in 1926, the business college at the University of Arkansas became the Sam M. Walton College of Business in 1998. Thanks to a $50 million gift from the Walton Family Charitable Support Foundation, the Walton College has become the state’s premier business college and a nationally competitive business school. The college has departments of accounting, economics, finance, information systems, management, marketing and supply chain management and offers full- and part-time MBA programs as well as a Ph.D. program. AACSB International accredited the college in 1931 and renewed the accreditation in 2012. At University of Arkansas, the most important factors in an admissions decision are a student's standardized test scores, undergraduate academic performance, and professional experience. Students are also required to submit three letters of recommendation plus two personal essays discussing their background and goals. Competitive applicants usually...At University of Arkansas, the most important factors in an admissions decision are a student's standardized test scores, undergraduate academic performance, and professional experience. Students are also required to submit three letters of recommendation plus two personal essays discussing their background and goals. Competitive applicants usually have a GMAT score of 600 or better and a GPA of 3.0 or better. For the full-time program, work experience is preferred, but not required. The future looks bright for Walton graduates. Not only are there “a huge amount of new jobs in this area per capita,” students say they “have a leg-up” with local employers through the school’s corporate partnerships. Walton offers a host of “great resources, like the career center, the writing center, and professional development classes,” which all contribute to the school’s excellent placement rate. One student raves, “The career serv­ices office has to be one of the best in the nation.” Not only do they provide career advice but they “will happily make calls on your behalf and are constantly engaging you in the process of finding a job.” For full-timers, “The Walton school does a great job of setting students up with internships,” and better yet, it’s “extremely easy to get a job after grad­uation at a great company.” In recent years, over 130 companies recruited on the Walton campus, with students tak¬ing jobs at companies including Axion Corporation, Deloitte & Touche, General Mills, IBM, KPMG, J.B. Hunt Transport Services, NBC Universal, Newell Rubbermaid, Tyson Foods, Shell Oil, Spectrum Brands, USA Truck, and, of course, Walmart. The 2012 grad¬uating class had an average starting salary of $60,555, with a range between $35,000 and $82,000. Just thirty miles from Walmart headquarters, the “top-ranked public business college” at the University of Arkansas—Fayetteville gets more than just its name from the world-famous retailer. “Walmart’s extensive involvement” in the school pays off in a thousand different ways, from fantastic internship opportunities to the “cutting edge” supply chain and retail management program—not to mention, the world-class business envi­ronment in Fayetteville. 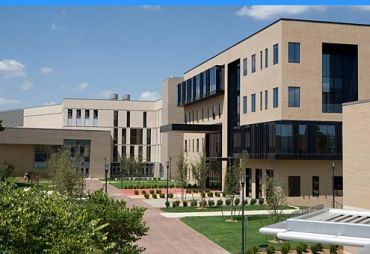 Thanks to the school’s famous benefactor, “Northwest Arkansas is a business epicenter,” with “over 1,500 suppliers based locally.” Without jetting off to New York or Tokyo, “Students are given opportunities to interact with Fortune 500 CEOs on a regular basis”—often without leaving campus. Here, “You’ll rarely find a day when there is not a CEO or other successful alumni coming back to contribute.” Walton operates two MBAs: a traditional full-time program and a part-time Executive MBA. With classes held “once a month on Saturdays,” the part-time program “offers a lot of flexibility for working professionals.” Students praise the “blended delivery,” which “incorporates both in-class and distance learning.” On top of that, “The adminis­tration ensures that the students lives are easy when it comes to enrollment and degree requirements”—they even provide all the materials (and meals!) on class day. For full-timers, the experience is likewise fast-paced, packing a full academic program—includ­ing an internship or overseas trip, independent projects, and case competitions—into just sixteen months of study. Students in both full-time and part-time programs are bowled over by the quality of the academic experience. With a name like Walton, it’s hardly a surprise that “the retail and supply chain management is highly recognized,” drawing many students already work­ing in the field. Yet professors across departments are “experienced professionals with real-world knowledge,” who are “incredibly gifted in their field of research” and “truly excited about the material they teach.” Professors are also willing to provide “addition­al instruction beyond class time,” both to help with class material and to “answer any questions we have related to application of learned material in the workplace.” The MBA is “very, very well run,” overseen by an administration that is “second to none.” A boon to busy students, “The administration ensures that the students lives are easy when it comes to enrollment and degree requirements.” They also “take steps to “improve the MBA program every year according to students’ feedback.” Icing on the cake, “The cost of the program is relatively inexpensive compared to their national rank­ings,” making a Walton education a rather savvy venture. Want more info about University of Arkansas, Fayetteville, Walton Graduate School of Business Full Time MBA? Get free advice from education experts and Noodle community members.